A full house is a happy house for the owners of this sunny bungalow, in which the pleasure is palpable. Every so often, you walk into a home and can really feel the love. At Danny and Sarah Carlsen’s Auckland abode, it’s all around. It’s there in the rare mid-century Jon Jansen armchair, one of two an elderly Trade Me seller and his wife sat side by side in all their days. It’s in the sentimental treasures carefully collected (like the ice-cream sign rescued during the demolition of a favourite eatery in their oft-visited holiday spot) and crafted by their own and loved ones’ hands. And it’s in their voices as they sit down to tell the tale of a cold 1920s bungalow that survived a 70s facelift to become a modern, warm-as-toast family home they plan to cherish for a lifetime. 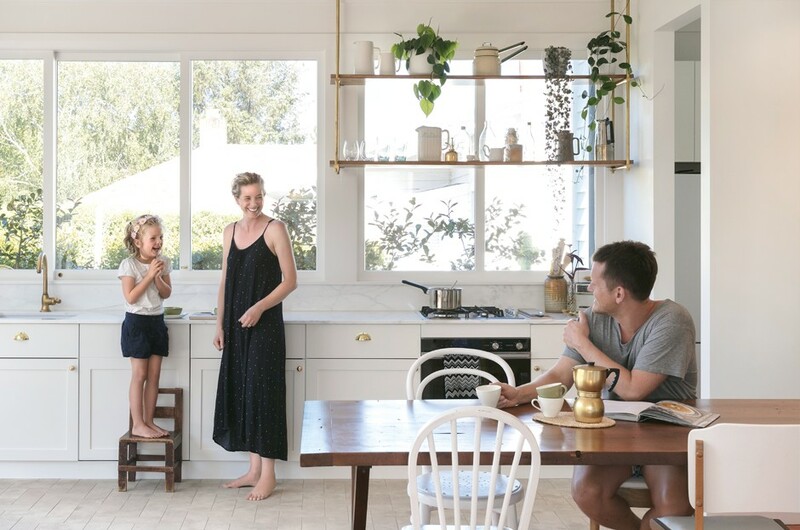 ABOVE Phoebe, Sarah and Danny in their sunny kitchen/dining area, where custom-designed shelving displays a selection of pieces found in op shops and gifted from talented loved ones. The chair Phoebe’s standing on was made from an apple crate for Danny by his father when Danny was a little boy. Another charming detail is found in the table made from upcycled timber removed in the reno: it’s complete with the hole where the telephone wire once ran into the wall. The couple’s own love story began 20 years ago, when they met as teens and began nurturing their dream of having a home they could share with others, where they could wine and dine family, friends and creative characters. “The opportunity to create this house was an extension of our vision of us as a couple,” says Danny. Auspiciously, the “dinky” bungalow became theirs at an auction on Sarah’s birthday. “We’d missed out on so many that we weren’t really thinking we’d get this one, but some things are meant to be,” she says. “There were Persian carpets everywhere, so if you dropped something, you could never find it!” laughs Danny. An update was clearly necessary, so 18 months after moving in, they moved out to make way for a renovation involving their nearest and dearest: architect and friend Chris Wood; Danny’s mate Ryan Bickley of 360 Degree Project Management; Danny’s builder brother Chris part of Ryan’s crew and brother Tim pitching in on the after-hours labouring; plus interior designer friends providing advice and encouragement. 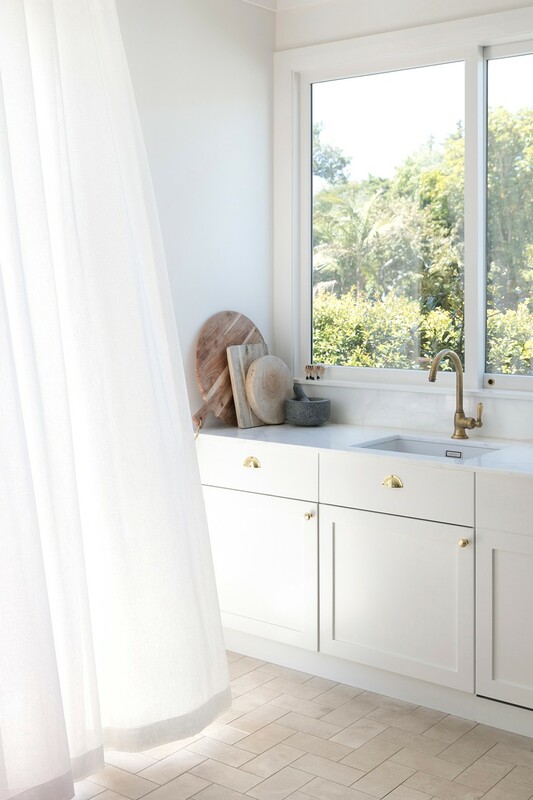 Replacing the sunroom and laundry with an extension that houses living, kitchen and dining was a priority, as was reviving the bungalow’s character. In the end, though they’d not intended to renovate the entire house, “we did everything,” says Danny. 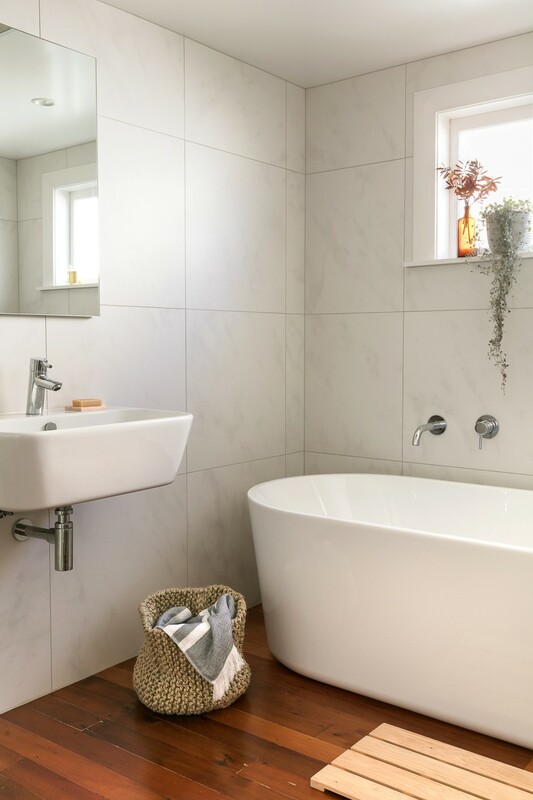 That meant that as well as the extension, they added a bedroom and deck; rejigged the entryway; painted and insulated; reinstated the skirting boards, hardwood doors and panelled ceilings; restored the bay window and installed in-built cabinetry in the main bedroom (formerly the lounge); revamped the bathroom and created an ensuite. In an epic “Texas chainsaw massacre”, ex-landscaper Danny overhauled the jungle-like garden too. TOP Complementing the open shelving and cabinetry by Chris Wood is a Bulb table lamp by Minimalux from Simon James, coffee table by Noguchi, vase from Flo & Frankie, and cushions, throw, bowl and rug from Città. The tumbled limestone tiles behind the Studio fire by Peter Haythornthwaite from Fires By Design forge a connection with the kitchen flooring. ABOVE Sarah and Danny both have fine arts backgrounds and their wonderful works are dotted throughout the home. The pieces in this central zone were painted by Danny for a Parachute Festival VIP area. That year, the tag line was ‘The happiest little place on Earth’, “so I thought it fitted rather well with our little house”, he says. The nifty little stool pictured here was a cheap-as-chips op-shop score. The heart of the finished home is a long dining table that draws you from the entryway into the extension. Initially irked by the “weird communal area” in the middle of the house, Sarah and Danny sought to make a change, but their architect had other ideas. With an insider’s understanding of the pair’s love of playing host, Chris suggested they make the perceived weakness of the home its strength, and design the house around it. The resulting space is a triumph, furnished by the table designed by Chris and made from rimu removed during the alteration. 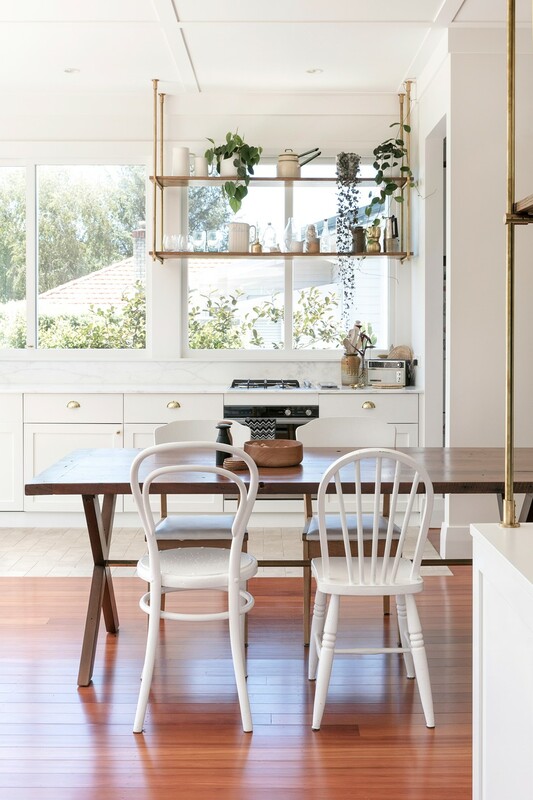 Its brass stretcher echoes the use of this metal throughout the house, from the handles of the period doors found on Trade Me to the open shelving designed by Chris and Danny, both a storage solution and a standout décor feature. As with the rest of the bungalow, the genius of the kitchen lies in its simplicity, and the elegant oak and unlacquered brass shelves exemplify that, allowing the deep bank of windows above the marble bench to let in maximum light and a layered view of the fragrant michelia plants and eugenia hedge outside. The pantry and most of the appliances are hidden in an adjoining scullery, while the dining table functions as another work surface. ABOVE Originally the bathroom, turned into the kitchen in the 70s and now the main bathroom again, this room has been given a restrained revamp. The towel and knitted jute basket are from Città, and the soap, wooden soap dish and wooden bath mat are from Everyday Needs. 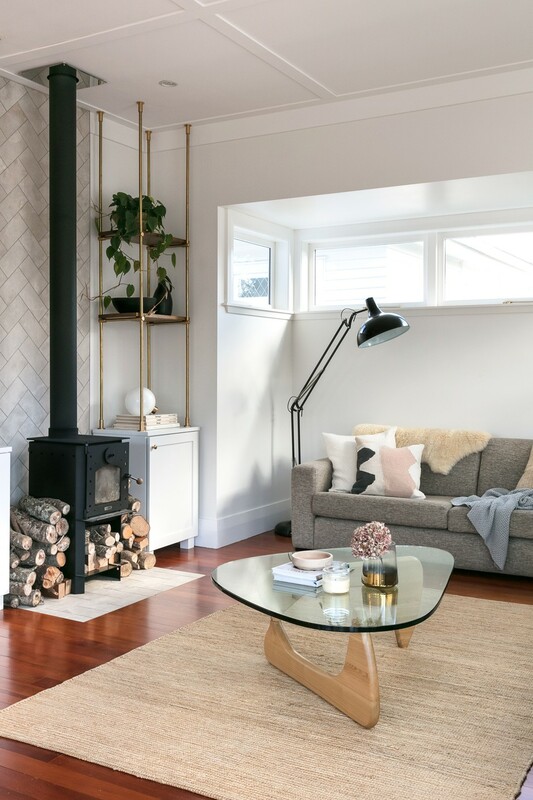 A shift in flooring from the kitchen’s pale tumbled limestone tiles (laid in a herringbone pattern accented with brass trim) to the warm heart matai floorboards of the living area creates a subtle definition between zones. In the living area, that fabulous shelving is integrated with bespoke cabinetry that sits either side of the new fireplace, which Sarah says is perfect for gathering around in the evenings and “taking a bit of the ‘grrr’ out of winter”. TOP In the master bedroom, charcoal artworks by Sarah team with an old physiotherapy heat lamp bought at second-hand haunt Whangamata Traders. 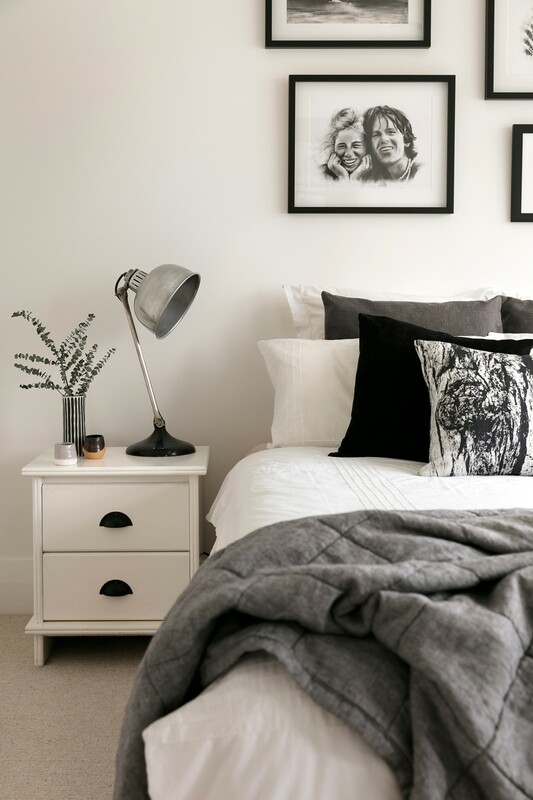 The Thea Ceramics pieces on the dresser are by the pair’s friend Esther McDonald, and the vase and cushions are from Indie Home Collective. 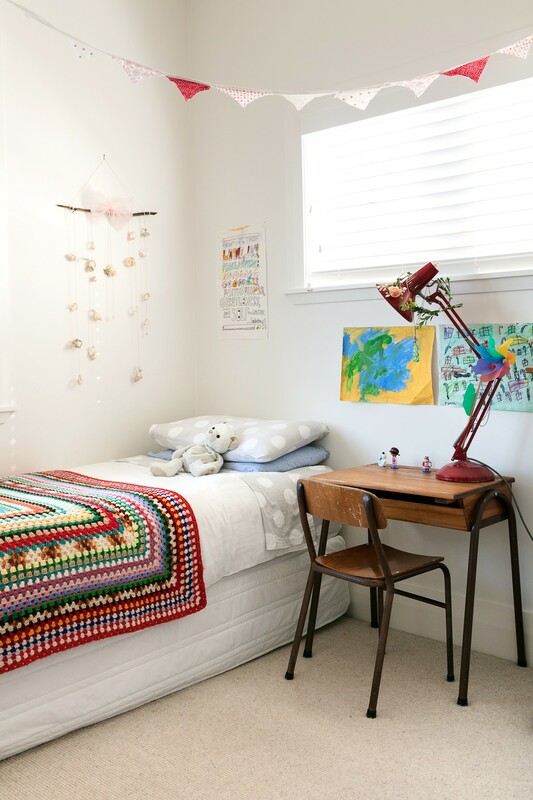 ABOVE Phoebe may have lost a metre of floor space when it was borrowed to create the ensuite in the room next door, but she scored when it came to her vintage desk, says Sarah. “Danny’s brother bought it on Trade Me thinking it was an adult size, so we ended up with it.” The couple made the mobile on the wall from shells collected from Whangapoua in the Coromandel, forming a sweetly sentimental link to the family bach, which was recently sold.